Public Utility District No. 1 of Whatcom County is a steward of water and energy resources providing locally controlled utility services and resource protection for the benefit of the residents, businesses and agricultural community of greater Whatcom. 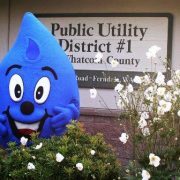 We are your community-based water and electric utility. With a locally elected Board of Commissioners, the PUD #1 has been meeting the utility needs of Whatcom County industries for over 80 years. The PUD #1 is also involved in local environmental, salmon habitat restoration, and utility issues in an effort to better serve the residents of Whatcom County. PUD #1 of Whatcom County, one of 28 PUDs in Washington State, is proud of its tradition of supporting requests for action from the citizens of Whatcom County. Water Commissioner of Rome, First Century A.D. It may be sunny and warm right now but it won’t belong before autumn winds blow and winter whisks in! Washington State Department of Ecology’s Water Resources Division is commemorating Washington’s first water law, which is turning 100 this year.